Acknowledged author Joel Feinberg wrote Philosophy of Law comprising 1039 pages back in 2013. Textbook and etextbook are published under ISBN 1133942962 and 9781133942962. 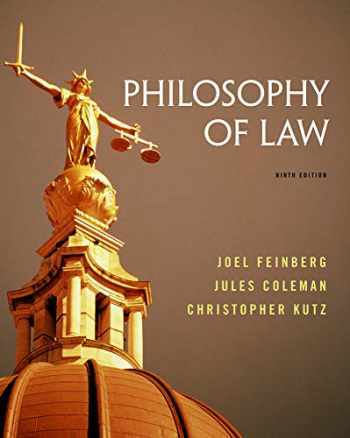 Since then Philosophy of Law textbook received total rating of 4 stars and was available to sell back to BooksRun online for the top buyback price of $57.37 or rent at the marketplace. This leading anthology contains essays and cases written by some of the most influential figures in legal philosophy, representing the major theoretical positions in the field. Its primary focus is to relate traditional themes of legal philosophy to the concerns of modern society in a way that invigorates the former and illuminates the latter. This classic text is distinguished by its clarity and accessibility, balance of topics, balance of positions on controversial questions, topical relevance, imaginative use of cases and stories, and the inclusion of only lightly edited or untouched legal classics. This revision is distinguished by its inclusion of new material on law and economics, international law, distributive justice, religion and freedom of expression, feminist legal theory, and critical race theory, as well as a greater emphasis on concrete legal problems.